International artists contribute to "Crystal Beings"
A piece from Alexis Arnold's Crystallized Book Series. Tucked away in the University City Science Center is the Esther M. Klein Art Gallery, a small showcase space where science, technology and art collide. On display at the gallery until Friday, March 20 is "Crystal Beings," a crystal-themed exhibit featuring nine artists from all over North America. Crystals, after all, are not just beautiful; the study of crystal structure has been integral to modern science. The art included in "Crystal Beings" is nothing short of striking. Curated by the Science Center's Angela McQuillan, the collection shows how each artist was inspired by or interpreted crystals in completely different ways. 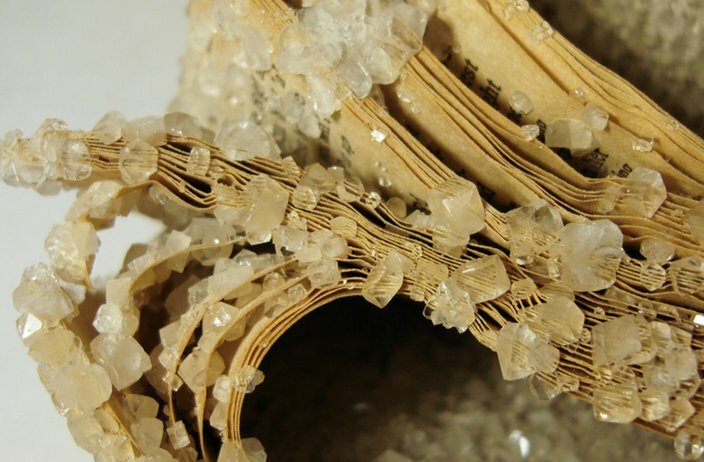 Alexis Arnold, a San Francisco-based artist, created abstract sculptures by soaking used books in a borax solution so that they crystallized. A San Francisco phone book and a tome by David Sedaris are among the "Crystal Beings." Honolulu-based artist Chris Ritson combined bismuth crystals with porcelain objects to create unique sculptures. Elyse Graham, from Los Angeles, created "geodes" out of colored resin, while the Berkley, California-based Malena Lopez-Maggi created colorful polymer clay "geodes." Jaime Alvarez, the only Philadelphia-based artist in the show, contributed photos from his "Terrene" photo series. 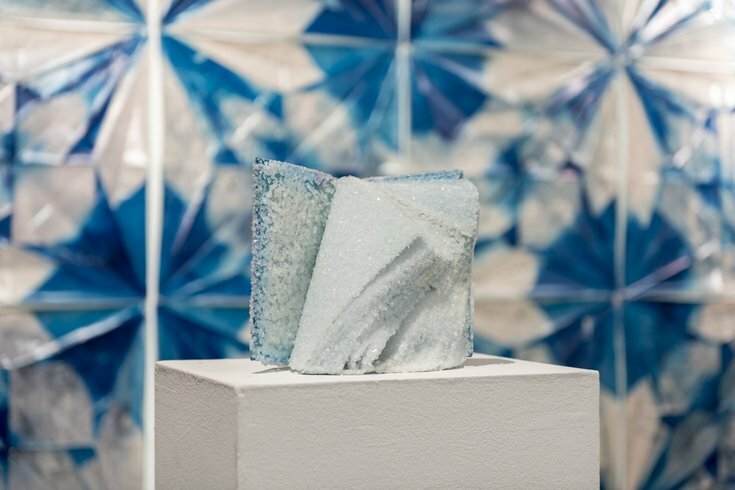 L.A. artist Christine Nguyen contributed a cyanotype wall installation made of photo paper and a fractal wall installation made of spray paint and paper. Vancouver, British Columbia-based artist Russell Leng's acrylic and spray paint art is in the show. McQuillan told PhillyVoice.com, "I was particularly attracted to his geometric "Mountain" painting series, because they looked like paintings of crystals, whether or not he intended them to." Two site-specific installations were created just for "Crystal Beings." 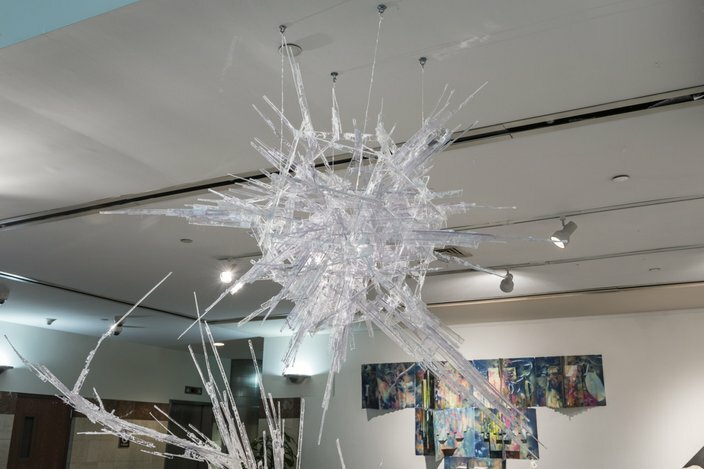 Baltimore-based artist Jonathan Latiano turned cast acrylic remnants and table salt paste into gigantic crystals that will be gone forever after the show is over (above). L.A. street artist A Common Name (Paige Smith) created a silver geode wall installation from paper and epoxy resin. Part of her urban geode project, these works typical are installed outdoors and degrade over time. The Esther Klein Gallery, also known as EKG, has been serving the community for over 30 years. Head over to EKG's Tumblr page for more photos from "Crystal Beings."